If you are a person who is having unlimited data plan and you don’t give a damn about internet bandwidth consumed by your OS, then you don’t have to worry about metered and non metered connections on windows 10 pc. But, what if you are concerned about your bandwidth usage on your PC, or it may be a case that your ethernet connection have a fixed data plan. In this case you must set your connection as metered to save internet bandwidth usage on your computer. But, here is the glitch. Windows 10 only allows setting wi-fi or cellular connection as metered and you can not set your wire connection (Ethernet connection as a metered one). But for every damn glitch there is a fix. Here in this tutorial i will guide you, how to set your ethernet connection as metered one. What are the advantage of having a metered connection? Stops downloading of apps update from Windows store. Deactivates features like Live Tiles, file synchronization etc. Step 1: – First of all press windows key + r and in run command box type regedit to open registry pane. Step 2: – Now, browse to the following location in the registry left panel. Step 3: – Once you reach DefaultMediaCost you will see 3G , 4G, Default, ethernet and wifi as options in the right panel. Step 4: – Just double click on ethernet. You have to change the dword value data from 1 to 2. 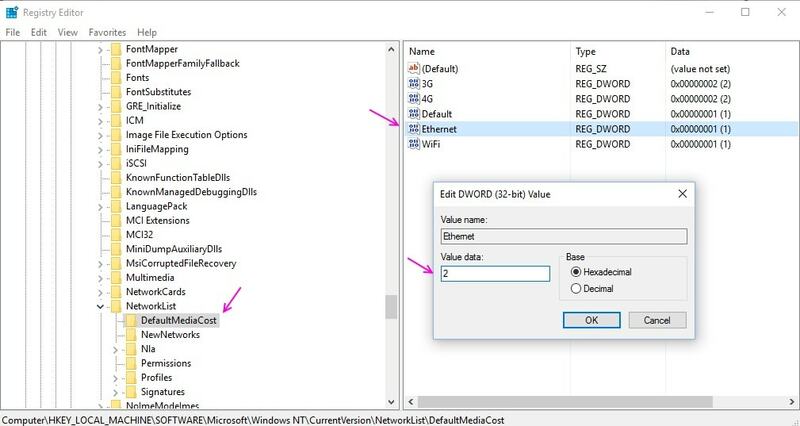 Step 5 : – But wait aminute, windows will not let you easily edit the dword value, as you do not have permissions to do that. It will show you an error as shown below saying Error editing value, Cannot edit ethernet , error writing the value’s new contents. Now, to fix this error, you have to take full ownership of the registry key. Steps to take full ownership of DefaultMediaCost registry key. Here is a full video showing you how to do this. Step 6: – Once you have taken full ownership of the registry key. Just change the value of Ethernet to 2. Final step : – Finally restart your PC for changes to take effect.